The dream of a Wolfen Empire has grown into a reality that the rest of the world can no longer ignore. The 12 tribes stand united and the Wolfen’s resolve strengthens. A clash between humans and Wolfen in the Eastern Territory seems inevitable and tensions strain. 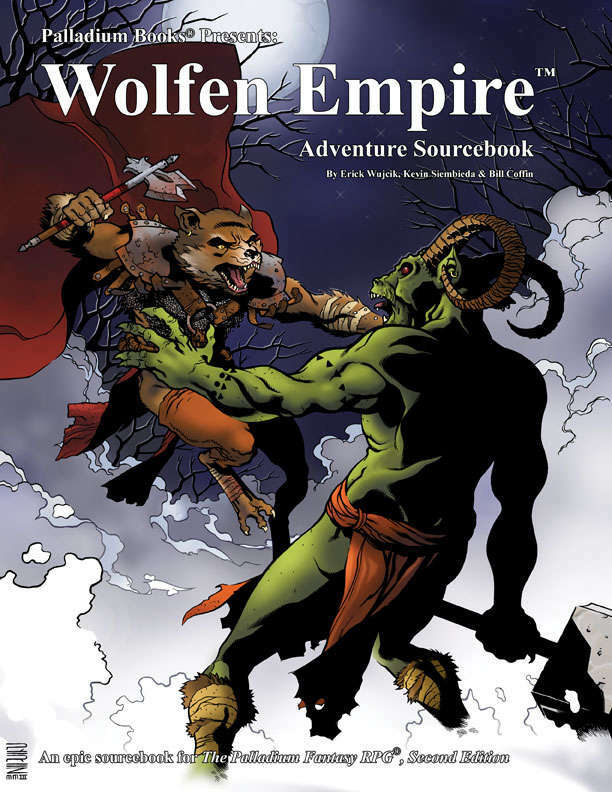 This adventure sourcebook presents a more detailed overview of the Wolfen Empire and how these canine people think. It also presents a half dozen adventures and over a hundred adventure ideas suitable for adventures in the region. In many ways it is a prelude that sets the stage of the Wolfen Wars about to erupt. The Great Northern Wilderness and Killer Winters. Wolfen history, religion, and economy. Wolfen Military – rank, positions and types. New animals common to the Northern Wilderness. Several fully fleshed out adventures and places. 160 pages of action by Wujcik, Siembieda, Coffin and others.